On June 7, 2014, on the eve of the feast day of the Holy Trinity - Pentecost, Patriarch Kirill of Moscow and All Russia visited the Holy Trinity- St. Sergius Lavra. 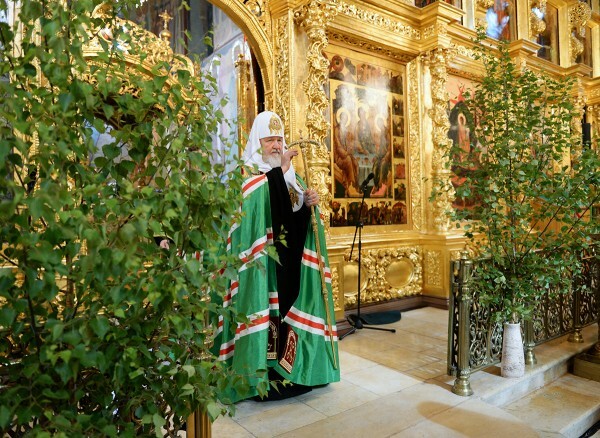 In the Trinity Cathedral, the Primate of the Russian Orthodox Church venerated the relics of St. Sergius of Radonezh. In the Dormition Cathedral, Patriarch Kirill led the evening vigil. After the Polyeleos, Patriarch Kirill anointed the faithful with oil. “I cordially congratulate you all, dear Vladykas, Fathers, brothers and sisters, with the feast day of our Trinity-Sergius Lavra. This is a special day for this holy monastery and for our entire country, for the whole of Rus’: by revealing the essence of Divine life in the United Trinity, the Abbot of our Land, the Venerable Sergius, taught people how to live together, to unite in the face of common challenges and problems, to defend their Fatherland, and together strengthen the nation’s spiritual life. This feast day is very uniquely experienced within the walls of Lavra, precisely because St. Sergius glorified the Holy Trinity like no other and lived according to the inner life of the Holy Trinity, the law of love, according to which he built his life, the life of the monastery’s brotherhood, and all people’s life according to this law.